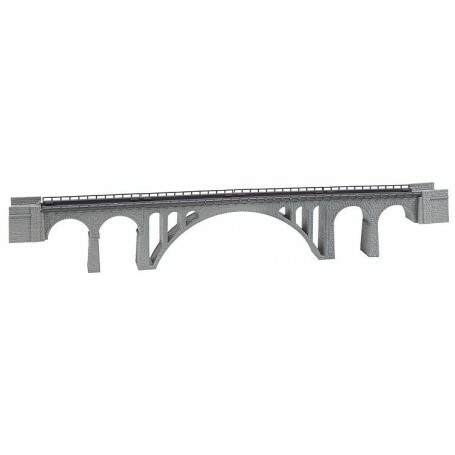 That straight viaduct with the aspect of massive stones is comprised of 2 bridge heads, 2 viaduct tops of 1 1/2 arch each and a central arch (can also be built separately). The viaduct set can be operated with a single track and is laterally secured by means of a railing. The original 111 m long construction is located near Guarda in Switzerland and spans the brook La Clozza with its 50 m wide central arch. This building kit contains: 68 single parts in 2 colours and 1 construction instruction.